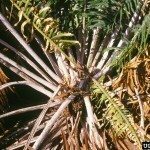 We have 2 Sago Palms that are flourishing. One of the palms has pods that are growing and pushing the plant to one side. Is there some way to get rid of the pods so the plant grows straight up? Thank you. Either spring or early fall would be fine for sago pup removal.